Update, December 23, 2016: Morgan McGuire has kindly fixed an issue in Markdeep pertaining to HTML mode. In an earlier version of this blog post I suggested a workaround, which has been removed now. Besides the utility has been extended to make it easier to update to new Markdeep versions. In response to Morgan McGuire’s request this post will explain how I set up this blog using his handy Markdeep, MathJax and WordPress. The blog is hosted on my rented server and when you request a page it usually won’t make connections to any other hosts to keep you from being tracked. Most of this post is specific to Markdeep, so you may also find it useful if you have no plans to use WordPress. Convenient offline content creation: My time for blogging is limited. If the creation of new posts and pages takes too long, I would end up not doing it. 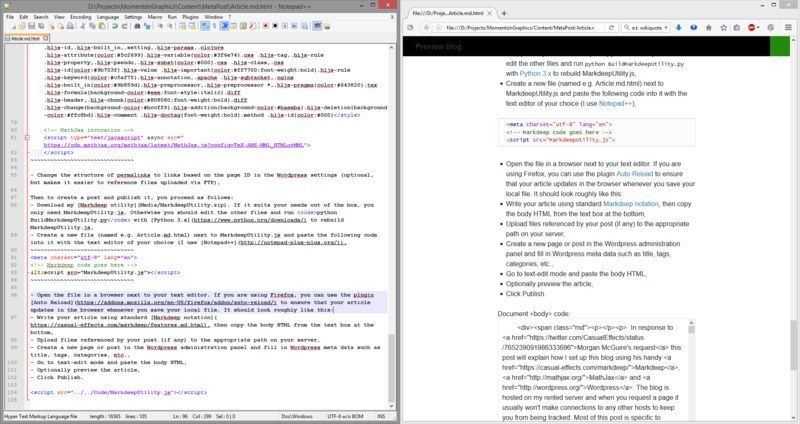 Therefore, I wanted a system that allows me to write posts offline with rapid iteration and convenient editing. Comments: Given my attitude towards PHP, I would have preferred a blog with completely static HTML pages. However, one feature that I care about requires some amount of server-side processing and that’s comments. Receiving feedback and getting discussions going is one of the key motivations for this blog, so I cannot do without comments. Available server: I already had rented a server with support for PHP and SQL. New domain: To make sure that I do not bind myself to the owner of some domain, I registered a new one. WordPress: Comments are built-in, the system is not too cluttered but just flexible enough and good themes are available. To avoid opening up security holes, I try to stay away from plugins. Setting up WordPress is easy enough and most of the default settings work for me. It took a little bit more tinkering to use preprocessed Markdeep output as content of blog posts and pages without hurting the rapid iteration. My first attempt was to use Node.js as suggested on the Markdeep webpage but that did not work because Markdeep does in fact require a DOM to function properly, i.e. there has to be an HTML-document in a browser window to work with. It adds an invocation of MathJax to the end of the head. The use of this extended script is the same as that of Markdeep itself. You add an invocation of it to the end of a text file with file-format extension *.md.html containing Markdeep code. On opening this file in a browser you see the Markdeep output within the surrounding webpage followed by a text box with the code for the body. This code can then be copied easily to post it online. There was one issue when using the unmodified code for the head. By default Markdeep uses a section numbering for all headings. However, in a WordPress environment there are many headings (e.g. in the sidebar) which you really do not want to be numbered. Eventually I decided that the section numbering is fairly pointless for blog posts anyway. Its main purpose would be cross references but you can do those via hyperlinks. Thus, I removed the section numbering altogether. The remainder of the code for the head was then added to the header.php in my WordPress theme. To figure out which other hosts my page references, I used the network traffic inspector in Firefox. Of course Google was in there. By default my theme of choice used fonts retrieved from a Google server. This leads to the one plugin that I am using. It disables use of these fonts. The code looked clean enough. Next I had to upload MathJax to my server and reference that in the head rather than using their content distribution network. Uploading the 32k files via FTP was slightly painful but worked eventually. Finally, I tried to find some page impression counter that would not phone home but I could not find anything decent and resorted to using the analytics provided by my server. If someone has a recommendation, that would be appreciated. The procedure for publishing a new post is not quite as automated as I would want it to be but that’s largely owed to the restrictions of my server. The first step is to upload all files (images, videos, downloads, etc.) referenced by the article via FTP. It is easiest to keep the paths consistent if you enable permalinks based on the page ID in the WordPress settings (e.g. http://momentsingraphics.de/?p=24). Then in the second step you create the post (or page) through the WordPress admin panel and paste the body HTML produced by Markdeep. Markdeep is being improved continuously. I will not update the Markdeep utility provided here with each new version of Markdeep. However, you can easily update it yourself. Just download the latest markdeep.min.js, replace the version that comes as part of the Markdeep utility and run the Python script BuildMarkdeepUtility.py. If the new version of Markdeep makes changes to the header code, you should also open ShowHeadAdditions.html to grab the new code. Add the following code to the < head > of your theme. It should be located in header.php. If you have installed MathJax on your server, you have to change the path accordingly. If you have updated Markdeep, just open ShowHeadAdditions.html in the utility package to get the new code to add. Optionally install a plugin to disable Google fonts.